Today, international negotiation dynamics in environmental issues are being overrun by their own success. The number of multilateral environmental agreements (MEAs) currently ranges between 500 and 700, depending on the source. Often based on sectoral considerations, these agreements complement each other in certain areas, but in many cases they also overlap or even contradict each other when it comes to instructions for action. Both the Millennium Ecosystem Assessment and the latest report of the United Nations Development Programme (UNDP) on achieving Goal 7 – environmental sustainability – clearly show that success at the negotiation level has not been able to impede environmental degradation so far. Deficits have been ascribed, among other things, to lacking coordination among the various MEAs, as well as between MEAs, on the one hand, and international development initiatives and world trade agreements, on the other. However, the greatest deficit is seen in lagging implementation. The United Nations Environment Programme – initiated in 1972 in Stockholm to coordinate environmental activities within the UN – is limited in fulfilling its task by lack of funding and weak leadership. Experts in developing countries are absorbed in intense negotiations and reporting activities, leaving little time for implementation efforts. At the national level, lack of political will and difficulties in adapting global political goals to country-specific contexts represent further obstacles to implementation. High-profile political leaders should be appointed to leading positions in important international environmental institutions. This will improve the international reputation of environmental concerns and strengthen their position in global policy. Environmental policies should be based on scientific findings rather than political considerations. Communication between the scientific community and policymakers needs to be improved. A shared vision, improved coordination and regular communication between the various MEAs are crucial to enhancing coherence in GEG. Environmental impacts can be improved by increasing the efficiency of all institutions involved, intensifying implementation efforts at the cost of negotiation activities, and monitoring compliance with agreements more closely. Environmental concerns should be mainstreamed into other areas of international policy and initiatives, such as the Commission on Sustainable Development processes, the Millennium Project, and, above all, the WTO agreements. However, implementing these suggestions for improvement is no easy task. Difficulties often arise from alleged details. For example, the various MEAs are based on many different concepts, ranging from linear causal chains to system-oriented approaches. This makes their various sets of indicators difficult to coordinate, let alone design coherently. For example, the Millennium Development Goals focus on producing results, while the 2010 Global Biodiversity Challenge attempts to reduce pressure on biodiversity. However, the authors of Linking the Dots succeed in identifying strategies and measures to link the various goals of the Millennium Project and the 2010 Global Biodiversity Challenge, leverage synergies and coordinate indicators. > Global Environmental Governance: A Reform Agenda. Adil Najam, Mihaela Papa, Nadaa Taiyab. IISD. 2006. 124 p.
> Linking the Dots: MDGs and the 2010 Global Biodiversity Challenge. Balakrishna Pisupati, Renata Rubian. Agorra Foundation. 2006. 44 p.
> Guidance for Promoting Synergy among Activities Addressing Biological Diversity, Desertification, Land Degradation and Climate Change. Ad hoc Technical Expert Group on Biodiversity and Adaptation to Climate Change. CBD Technical Series No. 25. 43 p.
A study by the International Food Policy Research Institute argues that developing countries will increasingly be forced to research and develop their agricultural technologies on their own. During the 20th century agricultural research focused primarily on increasing production. Funding was provided predominantly by few rich countries, while poorer nations were often able to benefit. In the meantime, consumption patterns in the rich countries have changed markedly, and agricultural research in these countries has been adapted to meet new needs. The centre of focus is now no longer on increasing productivity, but mainly on finding certain qualities in food products and researching entire production systems such as organic farming. The study presents the current status of agricultural research systems in nine developing countries. In addition, it describes the role of the research centres of the Consultative Group on International Agricultural Research. This study combines well with Paying for Agricultural Productivity, a report published in 1999 that describes changing agricultural research institutions and investments in developed countries. Together, they provide a global overview of current agricultural research around the world. How can these groups benefit from global economic dynamics? In other words, which accompanying measures are needed to harness globalisation for poverty reduction in rural areas? Among other things, the authors refer to two developments that question previous approaches. Both in Vietnam and in Egypt efforts are directed towards aggregating farms with a view to improving conditions for market production. This policy no longer concentrates on providing legal access to land for all farmers, and is thus diametrically opposed to many land reform projects. The second trend is towards reducing pressure on the agricultural sector, either by encouraging investments in non-farm rural economy or by supporting out-migration from marginal, unproductive areas. This latter approach acknowledges migration as a development factor, but at the same time exposes marginal regions to economic dynamics. This article raises questions that are both relevant and provocative. However, it is unable to provide conclusive answers in the present short version. Pastoralists are important actors when it comes to achieving the Millennium Development Goals in SSA. They account for a significant share of the local meat production. According to an FAO paper, pastoralism is the key to agricultural production in arid areas, which make up nearly 50% of the area of SSA. However, the pastoralist population in this region is rapidly growing – a trend that threatens to aggravate poverty. Policy-makers are therefore called upon to both improve the general conditions for pastoralism and develop alternative scenarios for pastoralists. More precisely, risks should be reduced, income diversified and alternative livelihood systems created. Frequent risks include drought, epidemic animal diseases, insufficient market access, and violent conflicts. According to this report, risk reduction is to be achieved by establishing early warning systems for drought prediction, enhancing collaboration between animal and human health services, eliminating illegal road taxes, and sharing responsibility for resource management. These measures could help pastoralists not only to sustain themselves, but also to contribute significantly to their national economies. Source: Policies and Strategies to Address the Vulnerability of Pastoralists in Sub-Saharan Africa. Nikola Rass. PPLPI Working Paper No. 37, FAO. 2006. 93 p.
A new adaptation tool was presented in a side event of the United Nations Climate Change Conference in Nairobi in November 2006. 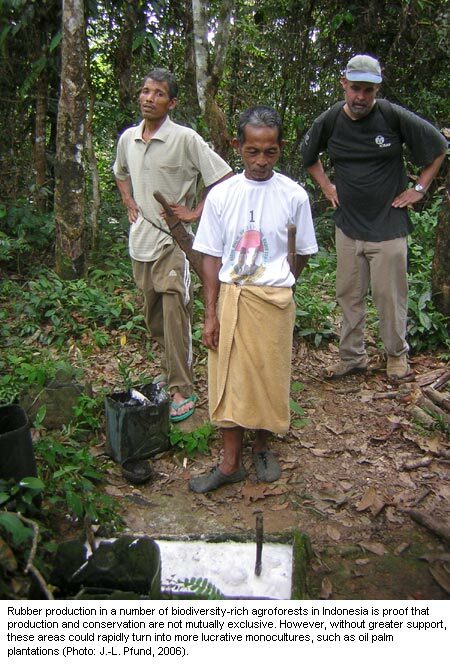 CRiSTAL (Community-based Risk Screening Tool – Adaptation and Livelihoods) was developed to promote integration of risk reduction and climate change adaptation into community-level projects. The tool helps project planners and managers to systematically assess the potential of their projects for enhancing local adaptive capacity, with a view to minimising risks of maladaptation. So far, very little guidance exists for mainstreaming adaptation at the programme or field project level. project screening and adjustment, which is carried out in collaboration with the project manager. The tool is available for free. People in Upper Swat are better off today than their counterparts in comparable mountainous regions of North West Frontier Province, Pakistan. This was revealed in an impact assessment of the Kalam Integrated Development Project (KIDP) conducted in 2005. The KIDP was a multi-pronged development project that ran from 1981 to 1998. Having begun with a special focus on forestry, the project later also included agriculture, marketing and social aspects. Agricultural diversification based on a value chain approach was identified as the project’s most successful component. The other important achievement was its contribution to changing the mentality of the people in Upper Swat regarding their capacities and their resources. However, talking with people in 2005 showed that they feel left alone with their problems and aspirations. They claimed that the project had been withdrawn too soon, leaving many things unfinished. This has raised controversies among development professionals. Source: Tracing impacts of the Kalam Integrated Development Project: Through memories & perceptions of local people, former project staff & other stakeholders. SDC, Intercoperation. 2006. 37 p.
Environment Sector Programme (FESP), supported by the Forest Governance Facility (FGF), is entrusted with this task. The aim is to guarantee transparency throughout the FESP implementation process, while at the same time ensuring that the local population has access to the benefits and income generated by the sustainable management of natural resources in Cameroon. Having established a shared language of communication and a common basis for understanding, it became clear that this initiative had to include the “public arena”, notably the press, in order to reach all relevant stakeholders. Other essential steps in this process are education, the dissemination of results, as well as the diversification of resources. However, one major problem remains unresolved: the absence of dialogue between the macro and meso/micro levels, as well as between theory and reality/practice. Sponsored by the Department for International Development (DFID) and SNV, an international development organisation, this initiative in Cameroon could prove to be a source of inspiration for other cooperation agencies. Pieter de Baan. 2006. 10 p. This article can be obtained directly from InfoResources. 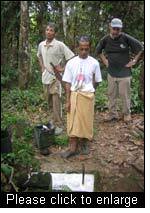 For many years the World Overview of Conservation Approaches and Technologies (WOCAT) global network has been documenting local farmers’ knowledge of soil and water conservation, making it available in a standardised form in its online databases. A new publication entitled Where the land is greener draws on this knowledge and presents a selection of technologies and approaches for sustainable land and water management, based on 42 case studies from around the world. The book is groundbreaking. Along with a systematic documentation and evaluation of technologies and approaches, results are for the first time analysed from a global perspective. In addition to highlighting both common success factors and critical issues, this review of local knowledge in a global context also serves as a basis for strategic considerations. These are addressed above all to decision-makers in governments and development agencies. Source: Where the land is greener: Case studies and analysis of soil and water conservation initiatives worldwide. WOCAT 2007. Co-published by CTA, UNEP, FAO and CDE. 364 p.
Thanks to up-to-date market information, five farmers’ associations in Tanzania were able to sell their maize at US$ 143 per tonne instead of only US$ 65. Use of mobile phones and so-called “market spies” enabled them to stay tuned to developments in prices and demand on distant markets, providing them with a sound bargaining position for negotiating an appropriate price. 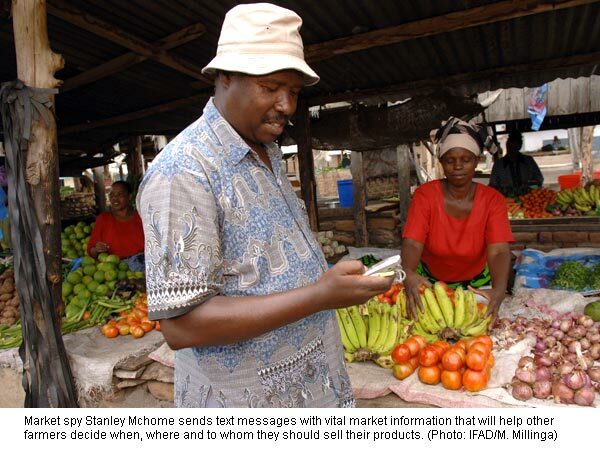 The First Mile Project run by the International Fund for Agricultural Development (IFAD) aims to improve access to markets and market intelligence for Tanzania’s smallscale farmers. On the one hand, this goal is pursued by promoting new communication technologies, such as mobile phones and the Internet. On the other hand, the project supports contact between small-scale farmers and other important members of the value chain, as well as exchange of experience among farmers. Information and transparent, trusting relations with traders and processors are equally important in successfully accessing the market. So far, experiences have been very positive: many farmers were able to boost their incomes considerably. After the project ends, the plan is for commercial businesses to take over. These service companies will be funded independently by the farmers, who will be paying for the services they receive. > The First Mile Project. Factsheet 2. IFAD. 2006. 12 p.
A handbook offers exporters in West Africa basic information on current import regulations and the most important voluntary certification systems of the United States of America, the European Union, and Japan. This complex matter is visualised in easily understandable illustrations. Numerous country-specific addresses and websites point to further information sources. The first part of the book describes the most important current import regulations. Issues addressed are quality and labelling, food safety, environmental regulations, customs clearance, and export promotion. The second part provides answers to frequently asked questions on voluntary private certification systems and briefly presents six of these systems, including organic farming, fair-trade and the EUREPGAP quality standards. This publication offers easy access to a complex topic for laypersons interested in exporting agricultural products from West Africa. Source: Regulations, Standards & Certification for Agricultural Export. A Practical Manual for Producers and Exporters from West Africa. Aïcha L. Coulibaly and Pascal Liu. FAO. 2006. 50 p.
The challenge facing our planet is striking the right balance between demands for food and natural resources and the need to protect the environment. The creation of new agricultural and grazing land continues to cause the fragmentation of tropical forests. Yet, such developments do not lead to the equitable improvement of the rural population’s living conditions. Combining their experience in agro-forestry research, the Centre for International Forestry Research (CIFOR) and the World Agroforestry Centre (ICRAF) have set up a new Biodiversity Platform focussing on multidisciplinary research in the field. Such an approach will help formulate acceptable compromises in relation to meeting the needs of local populations and environmental conservation alike. Trees and forests can operate as both a production and a conservation system, for example by serving as a biological corridor or as a refuge for wild flora and fauna. The idea is to ensure the recognition and negotiation of environmental protection services, that the local population can provide in an increasing number of “mosaic” landscapes. The CIFOR-ICRAF platform will promote land use planning processes which involve local populations, players from all levels of governance, as well as the private sector. The Swiss Agency for Development Cooperation (SDC) has accepted the entry proposal for the first project of the platform, which will cover more than six tropical countries.